As part of our Charity Support Programme, we were delighted to welcome thirty young carers from across Scotland to spend a weekend of respite at Hunters Quay Holiday Village in Dunoon. 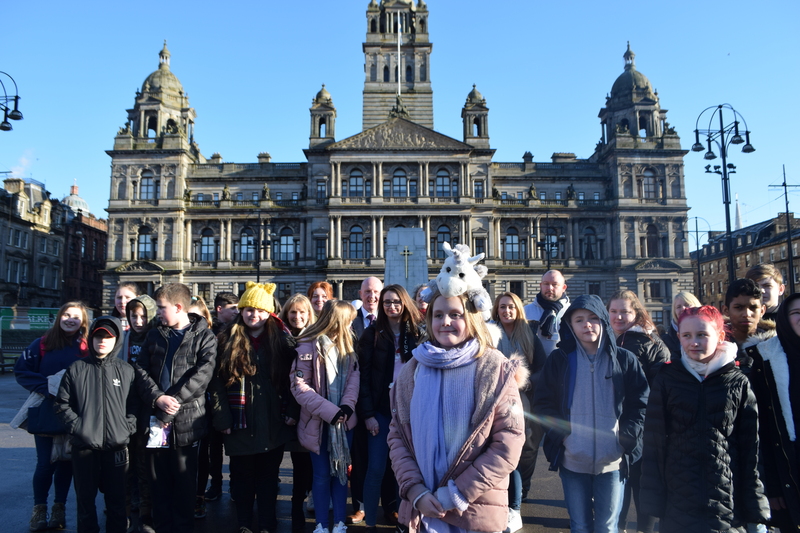 To provide this fun-filled weekend for these young people we teamed up with Carers Trust Scotland and the Scottish Young Carers Services Alliance giving these young carers some time to be and play like the kids they are. A young carer is someone under 18 who helps look after someone in their family, or a friend, who is ill, disabled or misuses drugs or alcohol. Because of this they don’t often get the chance to enjoy a break due to their caring commitment, so we wanted to provide a getaway to allow them to be children. We already work with carers across the UK to provide technology that makes their lives easier, so it made sense that we worked with Carers Trust Scotland to deliver this special project. The youngsters were buzzing with excitement as we met them all at George Square in Glasgow on the Friday. We had organised a bus, giving the children a chance to get to meet other young carers from right across Scotland. We were really fortunate with the weather and although it was brisk it was a beautiful day with the sun shining providing views right down the Holy Loch and Beinn Mhor which made the sail from Gourock with Western Ferries to Dunoon that bit more special. We would like to thank Gordon Ross of Western Ferries who we had told about this and offered a free return crossing for all of the carers and the bus which brought them over. The children arrived on Friday afternoon to be greeted with food at the restaurant area in the Hunter’s Quay. On Friday the children who had been booked into the luxury caravans were upgraded free of charge to the luxury lodges at the holiday park. On Saturday morning local MP Brendan O’Hara and local councillor Audrey Forrest came to meet the young carers and bring a bag full of chocolate, they spent the morning engaging and praising the young carers and expressed their gratitude to Carers Trust and ourselves for organising the well-deserved break. During the Saturday afternoon the carers had a chance to unwind, relax and play as numerous activities were put on offer for them. 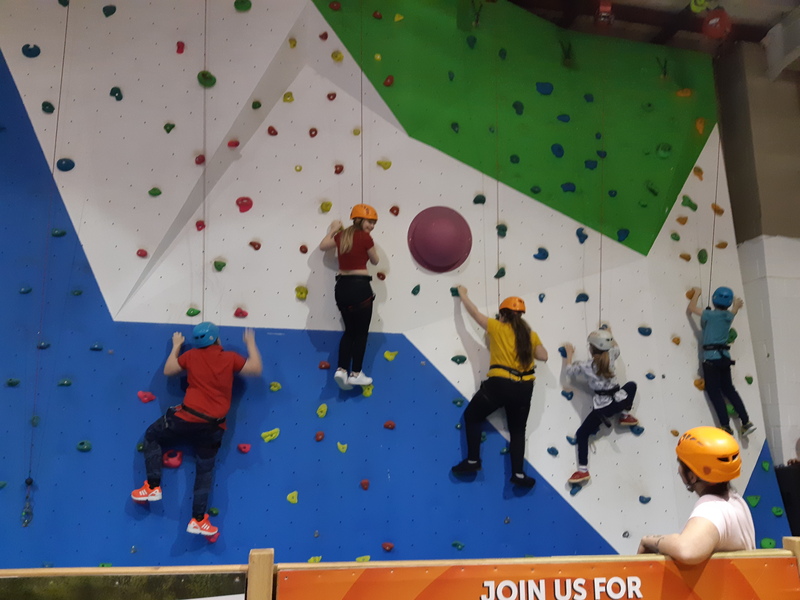 the chance to use the Holiday Park’s facilities, including a rock climbing, badminton, playing on the large bouncy castle and the swimming pool. In the evening the children got a real treat as the the local chinese takeaway provided a buffet and delivered it to the holiday park before putting their feet up and relaxed in their final night in Dunoon. 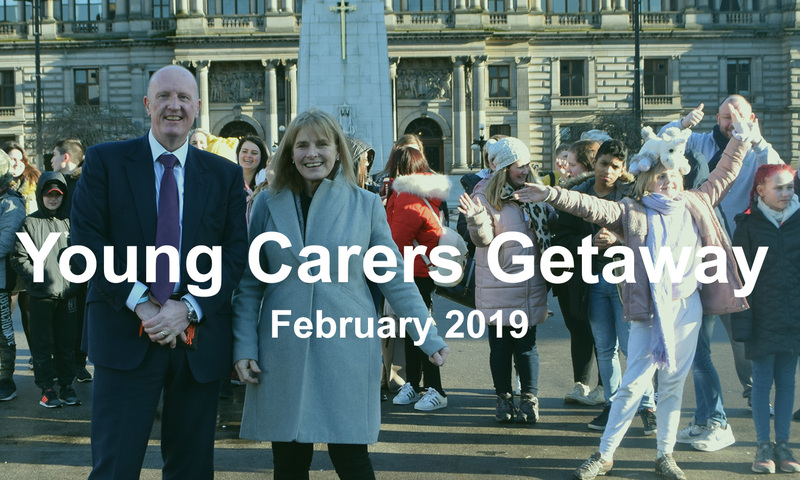 The Young Carers Getaway came after new research revealed that one third of young people aged 11-18 in the UK who give time to care for someone they live with experience risks to their mental health. 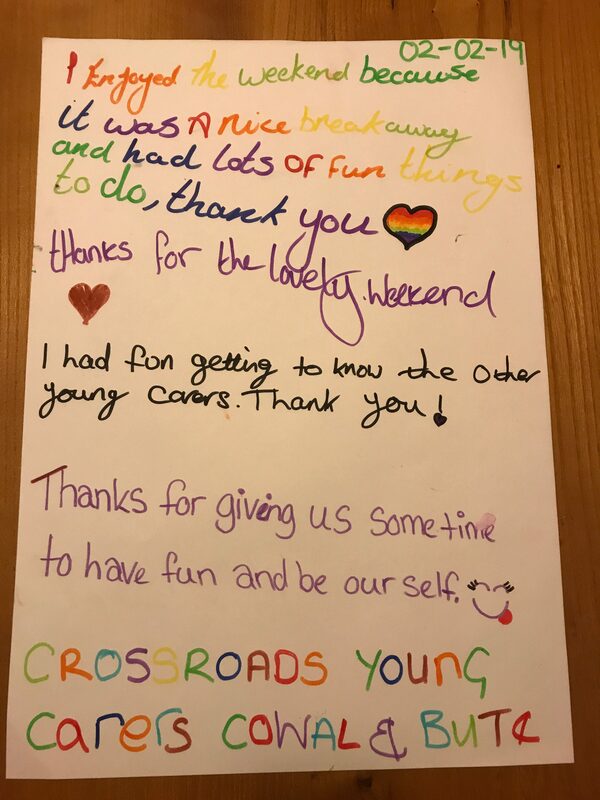 On the Sunday a number of the children wrote a letter to our CEO Tom Morton to thank him for organising and providing such a wonderful weekend for them. 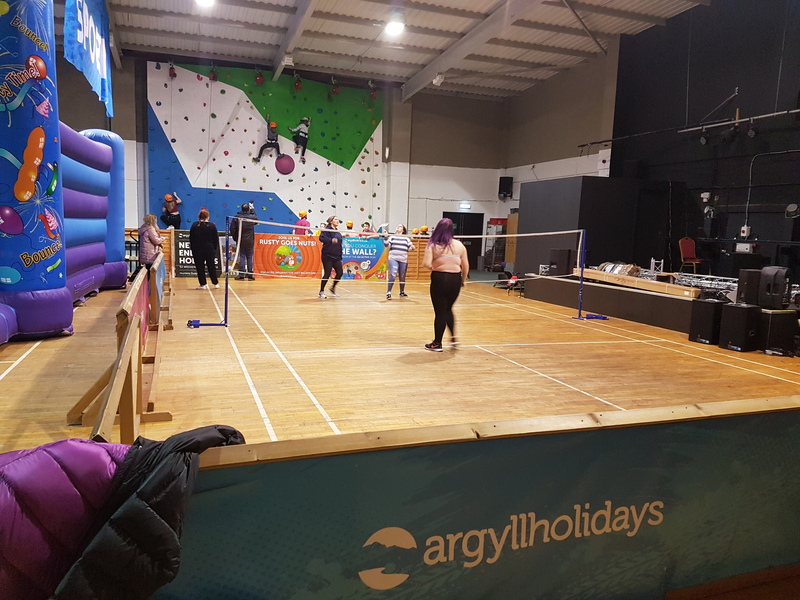 Tom Morton said: “I was so honoured to observe these amazing people simply kicking back and enjoying themselves playing Badminton, bouncing about, and climbing, at Argyll Holidays. When we see how much this weekend of respite means to these children it hits home to us how important the role unpaid care play in our society. As a digital telecare provider we can also see the use of technology as a means of increasing the amount of important respite for carers. Through the utilisation of the Internet of Things (IoT) and digital technology within telecare, we can provide a comprehensive and manageable solution which provides those in care with a trusted service or product and carers with peace of mind. We are always looking for further engagement with those in the Health and Social Care sector to keep improving how care is provided. The six partner charities that have been chosen to benefit from the Communicare247 and Safe Shores Monitoring Charity Support Programme are: Carers Trust, the UK’s largest charity for unpaid carers; Carr Gomm, which delivers high quality support services and campaigns to tackle loneliness and social isolation; Help for Heroes and Poppyscotland, which support serving and veteran armed forces personnel and their families; and SAMH and SANE, leading Scottish and UK charities that support people and families affected by mental illness.